Please note that this document is obsolete. A new version will be prepared following a project to restructure the RIPE Database documentation. This is a hands-on tutorial that walks the reader through the basic concepts and techniques that are needed to use the RIPE Database using examples and exercises. We use "attribute:" to indicate an attribute of an object. "RIPE Database" usually means the interface software rather than the information in the database. Where there may be any doubt, this manual will make clear what is being discussed. The RIPE Network Management Database, often called the 'RIPE Database' is a public database that contains information about registered IP address space and AS Numbers, routing policies, and reverse DNS delegations in the RIPE NCC service region. It is used for Internet network management. value" pairs displayed in plain text. remarks:       This object is only an example! This is a person object for John Smith. The attributes are "person:", "address:", "phone:" and so on. An attribute name always starts in the first column, and ends with a colon (:). Everything after the colon is the value. The RIPE NCC provides a TEST Database where users can learn how to use the whois database software. The TEST Database uses the same software as the RIPE Database, but changes in one do not affect the other. The data in the TEST Database is not a copy of the real data in the RIPE Database and is provided purely for learning purposes. All examples below use the TEST Database. However, all procedures described are the same for the RIPE Database. In section 5.0 Using the Production RIPE Database, we will explain what the differences are when using the RIPE Database. Do not use the production RIPE Database for testing purposes. It is good practice to delete all objects you have created in the TEST Database when you have finished the exercises in this guide. To query for a particular object the user specifies its "primary key:". This is an attribute value that identifies a unique occurrence of the object type. 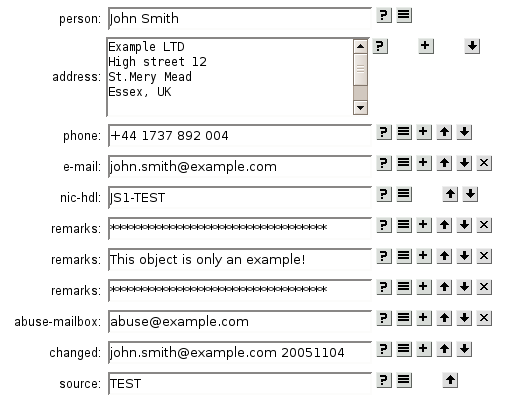 The reply includes the object in section 1.1 Database Objects. Note that the attribute value is not case-sensitive. The RIPE Database is used for storing information about Internet resources. You will need to create objects in the database to document your usage of these resources. Objects in the RIPE Database must reflect the current state of the resources they = describe. It is important to modify objects as the details of resources change, or delete objects if resources are no longer used. When IP addresses are assigned to customers, or new staff members are appointed as contacts, it is important to create new objects to reflect this in the database. With webupdates, users can directly create, modify or delete database objects using automated processing. After you submit an object update, the screen will return a complete report of the requested operation. If there were any errors, the update will fail, and the report will describe the reason(s) for this failure. If the error report does not help you resolve the problem, you can send a copy of it to ripe-dbm _at_ ripe _dot_ net. A RIPE NCC customer support representative will help you resolve the problem. The following sections describe the process of creating and maintaining objects in the TEST Database. By the end of this document, you will have learned how to create and protect an object representing a network assignment. 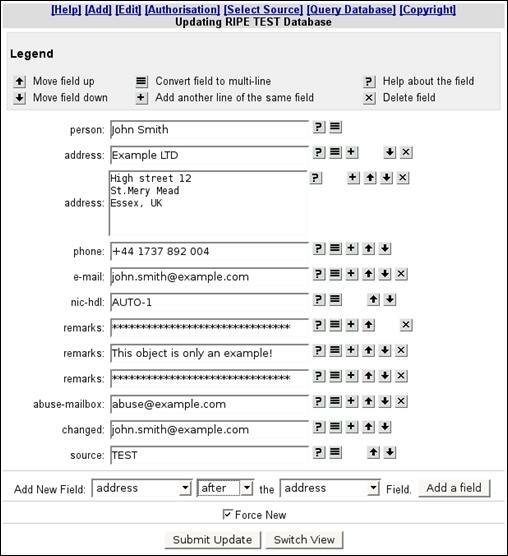 Throughout much of this document, you will learn how to perform modifications using the TEST Database. Before each update is performed, you need to select the TEST Database as source in webupdates. 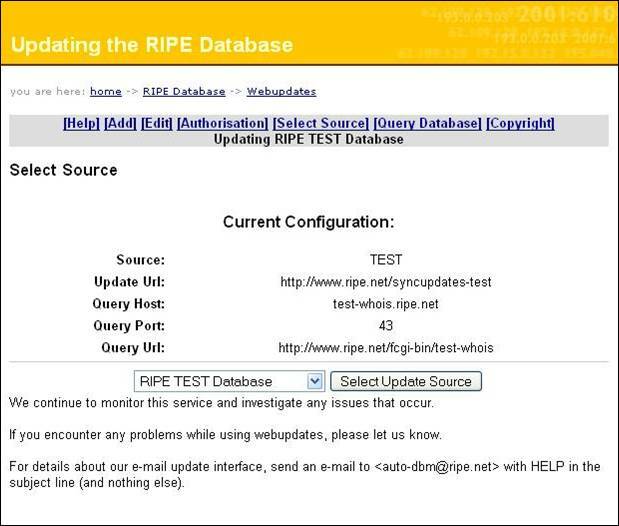 Select "RIPE TEST Database" from the list and press Select Update Source. The inetnum object contains information about registered IP address space; this includes the range of addresses, status and responsible contacts. Before this object can be created in the database, you must first create some preliminary objects. These objects contain information that is referenced by the inetnum object. A person object that contains information about the administrative and technical contacts for this network. This is referenced from the "admin-c:" and "tech-c:" attributes of the inetnum object. A mntner object that contains authentication information that identifies who can modify the contents of this object. This is referenced from the "mnt-by:" attribute of the inetnum object. The mntner object protects the inetnum object. Select the TEST Database as your update source. We tell you how to do this in section 3.1 Selecting the Database. In the next screen, enter the information for the attributes of the object that you are creating. Mandatory/Optional – If an attribute is mandatory, it must always be present inany object of that type that is stored in the RIPE Database. If it is optional, youcan leave it out. Single/Multiple – If an attribute is single, then only one attribute of that type canbe present in an object. If it is multiple, the object can contain more than oneinstanceof the same attribute. Note: To see the full template of an object type including the characteristics of all itsattributes, you can query the database for: "-t [object type]". When creating a new object with webupdates, only the mandatory attributes are shown automatically. You can add optional attributes and/or other instances of multiple attributes by using the Add New Field section. Return to the webupdates screen and prepare a person object to be created in the TEST Database. Use "AUTO-1" for the "nic-hdl:" attribute, your email address for the "changed:" attribute, and "TEST" for the "source:" attribute. By checking the Force New box, you guarantee that the object is only created if it does not already exist in the database. We recommend that you keep this option checked, to avoid accidentally modifying an existing object. 5. When you have finished setting up the object, press Submit Update. 6. Wait for an acknowledgement from the TEST Database to appear on your screen. Note: The text after the [person] tag (JSI-TEST) is the NIC handle of the person. It replaces the AUTO-1 value of the "nic-hdl:" attribute in the original submission. It will be unique and is the primary key of this person object. Any references to this person object will use this NIC handle. You can use the new NIC handle value to query for this object. If you do this, you can also see that the "changed:" attribute has had the date of the creation added. This is normal behaviour and is the reason for the "***Warning:" message in the example above. This message means that the update failed because of a problem with the syntax in the object. Check for invalid attribute values to find the cause of the error. "Authentication" is when you prove that you have the right to modify this object. This information prevents other users from modifying your data. In the database, the information that verifies authentication is stored in the mntner object (also called the maintainer object). previously for the person object. Note: For any object type, you can get the object's template with a detailed description of the meaning and syntax of each allowed attribute, by querying for: "-v [object type]". name must be a letter or a digit. The "mnt-by:" attribute refers to the mntner that is authorised to perform updates on an object. The mntner object usually maintains itself, so use your maintainer name (the value of the "mntner:" attribute) in the "mnt-by:" attribute. 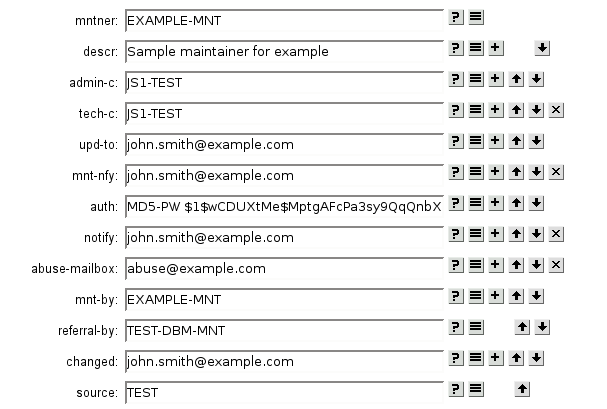 Use "TEST-DBM-MNT" in the "referral-by:" attribute. 3. When you have finished composing the object, press Submit Update. 4. Wait for an acknowledgement from the TEST Database to appear on your screen. If there was an error, correct the faulty attribute value(s) and re-submit the update. 5. The email address in the "mnt-nfy:" attribute of the mntner will receive an email that will contain details of the new object. Your new mntner object, as well as the person object referenced, will be returned. some of the attributes are not shown. This time, only the mntner object is returned. Disabling recursion can result in a smaller, easier to understand reply, especially when associated contact information is unimportant. This is often the case when managing your own objects. Now that you have a mntner object, you can protect other objects in the database. An object is protected by adding a reference to the mntner in the "mnt-by:" attribute. Most object types require you to protect them with your mntner object. However, person objects do not. We recommend that you protect them. 1. As before, within webupdates, choose the TEST Database as your update source, click on the [Edit] option and enter your person object "nic-hdle:"
You can also enter your "person:" name instead of the "nic-hdl:" value. In this case, a list will be returned with all person objects that have that name. For common names, there may be many entries returned. Choose your object from this list. Using the Add New Field section, add your mntner as the "mnt-by:" for your person object. The database will not allow you to use a "mnt-by:" value, unless the mntner object already exists. An error will appear in the acknowledgement returned after you submit the update. 3. Add an additional "changed:" attribute to reflect the fact that you are modifying the object. Follow the same procedure shown above for the "mnt-by:" attribute. It must be placed after the existing "changed:" attribute values. 4. When you add a "mnt-by:" attribute to an object, you must authenticate yourself as the new mntner object. 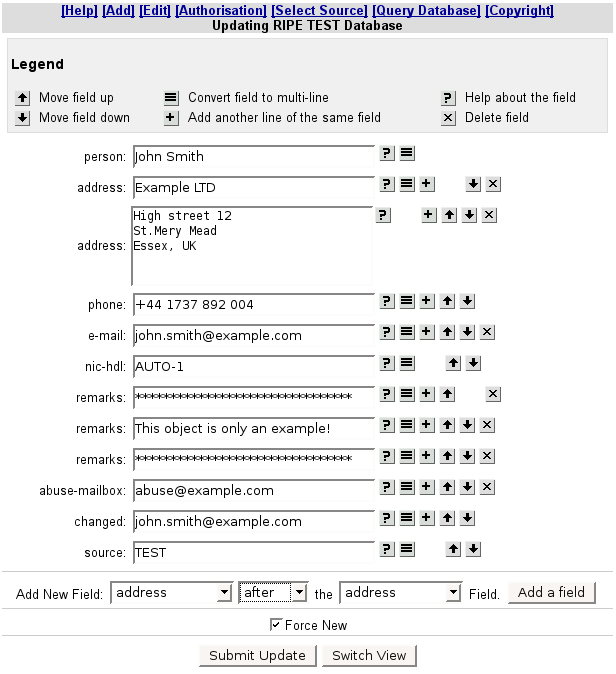 As this example uses the MD5-PW method, add a "password:" field to the object, using the Add New Field section. The position of this field in the object is not important. 5. The final edited object should look similar to the one shown below. Click on Submit Update when you are ready. In this case, you can just correct the password and re-submit the update. Network assignments are represented by inetnum objects. Before you can create a new inetnum object, you must find a range of IP addresses that are not currently assigned. This section describes how you can query the database for this information. You can also use the queries whenever you want to get IP address information from the database. This is called the less specific match. The range 10.11.12.0 - 10.11.13.255 fits entirely within the range 10.0.0.0 - 10.255.255.255. This is the smallest inetnum object in the database that encompasses the IP range in your query. If you want the server to give you only an exact match, then you can request this using the "-x" flag. An exact match is one where the IP range of the inetnum object is the same as the IP range in the query. Sometimes, you may want to see all of the less specific inetnum objects that encompass a range. In this case, you can use the "-L" flag. If you do this, you will see all inetnum objects that encompass the entire range queried, as well as any exact match. remarks:        The country is really worldwide. remarks:        This is an automatically created object. For the query examples shown above, the "-B" flag was not included. 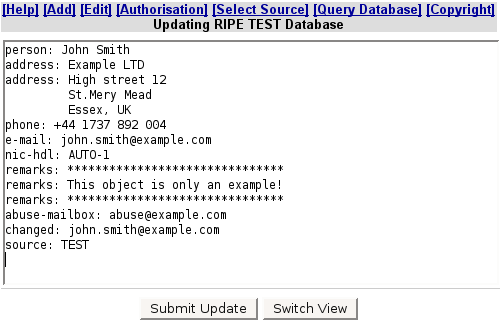 The output from the RIPE Database was filtered for contacts, as described in 3.4 Registering Authentication Information. Therefore, the objects above are not shown fully. The "# Filtered" tag in the "source:" attribute tells you that the object was filtered. From here on, we will use the "-B" flag in most queries. This will retrieve the full objects as they are stored in the database itself. You can also look for smaller inetnum objects corresponding to sub-ranges that are completely contained within a given range. This is a more specific query. You can use this on an allocation to look for ranges that have no other assignments. To do this, use the "- m" flag. This is a one-level more specific query. This means that the largest inetnum object that is completely contained within the given range is returned. In this example, the IP addresses 10.11.12.0 - 10.11.12.255 are not assigned and are available. You will need to find an available range to do the exercise in the next section. This will return all levels of inetnum objects in the range. This can return an extremely large number of objects, but can be useful for finding all of the inetnum objects for a portion of the Internet. Now that all of the objects necessary for an inetnum object have been created and protected and you have located an appropriate range of IP numbers, you can create the inetnum object itself. It should be noted that this method of 'finding' IP ranges to 'use' is only for test purposes in the TEST Database. Here you can create any inetnum objects for testing purposes, even if you have no authority over that range. For the "inetnum:" attribute, enter the IP range that you want to register. Since this is just for the TEST Database, it doesn't have to be a range that is really allocated to your organisation. You can use any available IP range. Follow the instructions in section 3.6 Locating Network Assignments to find an available IP range in the TEST Database. For the "admin-c:" and "tech-c:" attributes, use the nic-hdl of your person object. For the "status:" attribute use 'ASSIGNED PA'. For the "notify:" attribute, use the email address where you wish to be notified of any updates to this object. For the "mnt-by:" or any other "mnt-*:" attribute, use the name of your maintainer. This will work for any object type. Once again, you will need to provide authentication for your maintainer to create this object. 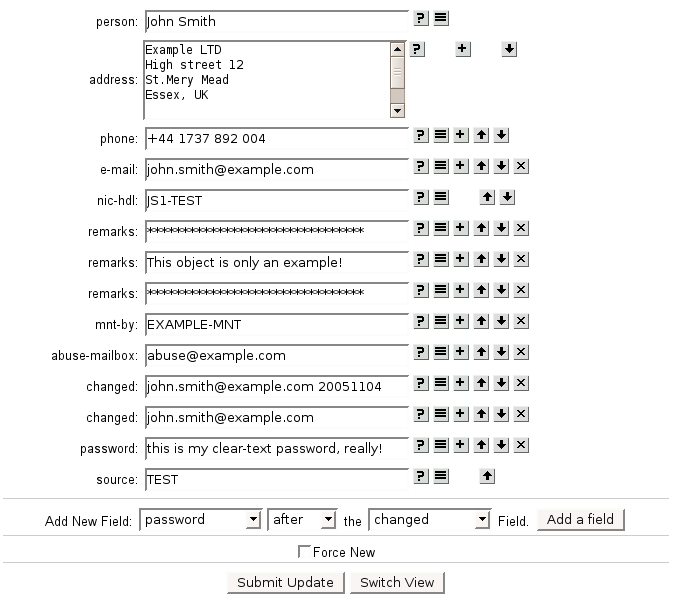 Add your maintainer password to the field "password:". You can find out how to do this in Section 3.5 Protecting Your Contact Information. The creation of new inetnum objects must also be authorised hierarchically. This means that while creating an inetnum object, the authentication for the one-level less specific inetnum object (encompassing IP address range) is also required. The "mnt-lower:" attribute in inetnum objects allows you to specify a specific maintainer for the creation of more specific (sub-assignments) inetnum objects. Look for the mntner object referenced in the "mnt-lower:" attribute. If there is no "mnt-lower:" attribute, the mntner object referenced in the "mnt-by:" attribute is used. To allow users to freely create inetnum objects in the TEST Database, we have published the password for this maintainer. descr:          Mntner for TEST DBM objects. remarks:        Password is "emptypassword" without the quotes. 3. See below for an example of a new inetnum object. Click on Submit Update. 5. If it is successful, the email address in the "mnt-nfy:" attribute of your mntner object will receive an email with the details of the new object. You can modify information in your inetnum object. You might need to do this if the technical contact has changed and is now represented by the person object "MJ3-TEST". Click on [Edit] in webupdates. In the text box, enter one IP address of the inetnum object range, the full IP range, the "netname:", or even the name from the referenced person object(s). Click on Edit Object. From the "Search Results" list, select your inetnum object and click on Edit. Using the object editor, change the "tech-c:" attribute to the new person object. Add a "notify:" attribute, so the new technical contact will be notified when the inetnum object is modified. You also need to include the password for your maintainer so that the modification is authorised, as well as a new "changed:" line to keep track of the history of modifications to the object. The new "changed:" line must follow all existing ones. Note: The hierarchical authorisation is only required for creation of inetnum objects, not modification. You do not have to include the second password (from the less-specific IP block) in this update. You cannot change the primary attribute of the object (inetnum: 10.11.12.0 -10.11.12.255). The database will consider this to be a creation of a new object. Wait for an acknowledgement from the database. This will tell you if your update was successful. If there was an error, the message that you receive will tell you what was wrong. The email address in the "notify:" attribute of the original object will be sent a message with the details of the change. In a similar way, a notification email will be sent to the "mnt-nfy:" of the maintainer. Sometimes you no longer need objects that you maintain. You should delete these. For example, if an assignment is no longer used you should delete the inetnum object and all person and mntner objects that are referenced only from that object. 1. Select the object that you wish to remove using the [Edit] option in webupdates. Follow steps 1 and 2 in Section 3.8 Modifying the INETNUM Object to query for this object and present the object details. 2. In the object editor, do not change any of the attributes. If the object submitted is not an exact copy of the one stored in the RIPE Database, the deletion will fail. Add only a "password:" field to authenticate you as the valid maintainer. Deletion of objects in the RIPE Database/TEST Database must also be authorised. This indicates that this object is to be deleted from the database. 5. Wait for an acknowledgement from the database. This will tell you if your deletion was successful. 6. The email addresses in the "notify:" attribute of the object, as well as the "mnt-nfy:"attribute of the mnt-by: mntner attribute of the mnt-by: mntner will receive a message with the details of the deletion. This will return all of the objects that reference EXAMPLE-MNT. The "-i" flag requests the inverse query, and the "mnt-by,mnt-lower,mnt-routes,mnt-domains,mnt-ref" specify which attributes you want to look at. There must not be a space after any of the commas. The "-r" disables recursion (associated objects will not be displayed). Before you can delete a mntner object, you must remove all references to it. Modify the person object, and remove the "mnt-by:" attribute. This removes all protection, but this is not a security issue, because the object will be deleted. Please remember to delete all objects you created in the TEST Database while doing these exercises. If you want to use your maintainer authentication password in several updates, you can save it for a specified amount of time. Before starting to update any of your objects, click on the [Authorisation] option. Type in your password and select the amount of time that you want to keep your password in memory. You can now start editing your objects. From here on, and for however long that you specify, all updates submitted through webupdates from your computer will automatically include the password you entered. Using webupdates, you can edit an object in text-based mode, instead of the field-based mode used so far. This can be helpful in situations when copy-paste operations are needed. In this mode, you can edit the object as free text, including adding and removing attributes to the object. Pressing Switch View once again switches back to the field-based mode. Pressing Submit Update submits your update to the RIPE Database. You can switch between both edit modes while editing an object. However, please notice that webupdates will only let you switch from text-based mode to field-based mode, if there are no syntax errors in the object. Another way of updating objects in the RIPE/TEST Database is by using email. This is useful if you need to update several objects at the same time. You should send updates for the TEST Database to <test-dbm _at_ ripe _dot_ net>. We automatically process all updates sent to this email address, no human handling is involved. Include the complete objects that you wish to update (create, modify or delete) in the email, with at least one blank line between each object, and completely aligned to the left (no space characters at the beginning of the lines). Please don't include any blank lines in between the attributes of any object, as this will prevent it from being recognised. Include in the email, all the clear-text passwords needed to perform the updates, with the following syntax: password: [clear-text password]. You need only include each cleartext password once in the message, even if it is required by several objects. for the end-user called "Example"
password: this is my clear-text password, really! After your update has been processed, you will receive the results by e-mail. The reply will tell you which objects were updated successfully and which ones failed. For the objects that failed, you will get an explanation with the errors. This is similar to what is shown in the webupdates report. You can also perform queries on the database by using a whois software client. There is a whois client, developed by the RIPE NCC, available for free download. Where <query-text> is the full query text that would be entered in the web query box shown in Section 2.1 Web Queries. Disables the default query behaviour of filtering the "notify:", "changed:" and "e-mail:" attributes, to protect users from contact abuse. This flag is helpful for retrieving the objects exactly as they are stored in the RIPE Database. It is important to use this flag when updating database objects by email, to prevent information from being lost in the update. Disables the default query behaviour of recursion for contact information after retrieving the objects that match the lookup key. You should use this flag if you do not want to retrieve the person and role objects that contain the contact information associated with the object that you are querying for. Requests a template for the specified object type. Using this flag you can see all the possible attributes used in an object type as well as their characteristics. Requests a verbose template for the specified object type. This flag works as –t, but also gives you a detailed explanation of each attribute, and the expected syntax. It can be very helpful when you receive a syntax error while updating an object in the RIPE Database. Perform an inverse query. This flag is useful to see in which objects a certain object is referenced. will show all the objects that are maintained by the maintainer EXAMPLE-MNT. One-level less specific query. This returns the smallest inetnum range that encompasses the entire IP range specified in the query, excluding the exact match. All-levels less specific query. This returns all the less specific inetnum objects that encompass the IP range specified in the query, including the exact match. All-levels more specific query. This returns all the levels of inetnum objects contained in the IP range specified in the query, excluding the exact match. This can return an extremely large number of objects, depending on which IP range is used. In a default IP range query, without any of the flags mentioned above, the exact match object will be returned. If no exact match is found, the one-level less specific inetnum object will be returned. You should now have an understanding of the basic concepts of the RIPE Database and be able to maintain your own data and perform queries. This section explains the differences between the TEST Database and the RIPE Database. You should send email updates for the RIPE Database to <auto-dbm _at_ ripe _dot_ net>. Objects in the RIPE Database use RIPE for both the "source:" attribute and the suffix appended to "nic-hdl:" attributes. When creating your mntner object in the RIPE Database, use RIPE-DBM-MNT for the "referral-by:" attribute. You cannot create inetnum objects in the RIPE Database unless you have received authorisation from the LIR that holds the responsibility for that address range. The following resources are available to help you use the RIPE Database. A query for "help" will return a full list of all of the 'flags' that you can use when you query the database. While we covered some of these in this document, there are many others. We frequently update this page with helpful information based on the needs of users and new features offered by the software. Here you can find the latest versions of the RIPE Database Reference Manuals, which contain detailed information about all of the topics covered in this guide, as well as other relevant documents covering how to use the RIPE Database. If you have a specific question that has not been answered in this guide, send it to <ripe-dbm _at_ ripe _dot_ net>. A RIPE NCC customer service representative will answer your mail.